love her youtube and both books, highly reccomend! No Stone Unturned recreates the genesis of NecroSearch International: a small, eclectic group of scientists and law enforcement personal, active and retired, who volunteer their services to help locate the clandestine graves of murder victims and recover the remains and evidence to assist with the apprehension and conviction of the killers. Known early on as "the pig people" because of their experiments in locating graves using the carcasses of pigs (due to their similarities to human bodies), NecroSearch has evolved and expanded into one of the most respected forensic investigation teams in the world. 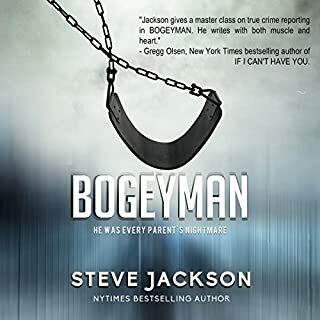 In No Stone Unturned, New York Times best-selling author Steve Jackson, the author of Bogeyman and Monster, vividly tells the story of this incredible group and recounts some of their most memorable early cases that separately would make great true crime books. Following his participation in a NecroSearch expedition to Russia looking for the remains of a Russian noble in 2013, Jackson was made an honorary member of NecroSearch International in November 2014. In some murder cases the police are pretty certain who the killer is, but won’t risk taking the suspect to trial due to the lack of a dead body. Without a body, the chances of a successful conviction are greatly reduced and then, after an acquittal, the suspect would usually be protected from subsequent prosecution by the Double Jeopardy statute. So, finding a body becomes a crucial factor in getting these dangerous individuals off the streets and into jail. This book tells the story of a group of superheroes who come to the aid of the police in searching for the hidden bodies of murder victims. They are a band of boffins; nerdy egg-head scientists in the Clark Kent mould. Each of them has their own special superpower: There is the man who can see under solid concrete with his ground-penetrating radar, the woman who can locate a grave in a vast wilderness by sifting through the plant life entangled in a lock of hair, and the master of a bloodhound pack whose dogs have a sense of smell 30,000 times stronger than humans and can sniff out a long-dead corpse 6-feet underground. These three, and several other scientists with different but equally valuable skills, gave themselves the name ‘NecroSearch’. This name sounds more like an organisation devoted to evil than one so determined to perform good deeds, but I suppose the choice of this odd name for the group is emblematic of its members' eccentricity. Their mission is to assist law enforcement officers to find lost bodies, bringing closure to grieving loved ones and justice to malicious villains. The book focuses on just a few of the group's cases and tells these few stories in quite some detail. The bodies they look for seem at the outset difficult or impossible to find, but by using their ingenuity and pooling their resources they are usually able to overcome these adverse odds to unearth the precious bones and scraps of clothing that have endured the ravages of time. Some of the stories are very moving; we become attached to the victims by hearing the details of their lives and how they met their desperate, tragic deaths. We become equally immersed in the painstaking but inspired quests for their lost bodies. 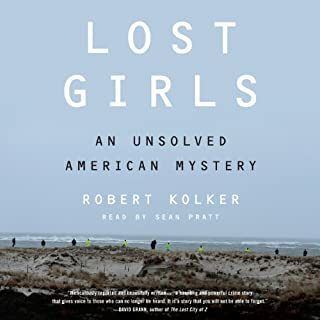 The book was written quite some time ago (with a recently added epilogue), but its age doesn’t spoil the compelling story of the search for these unfortunate people. 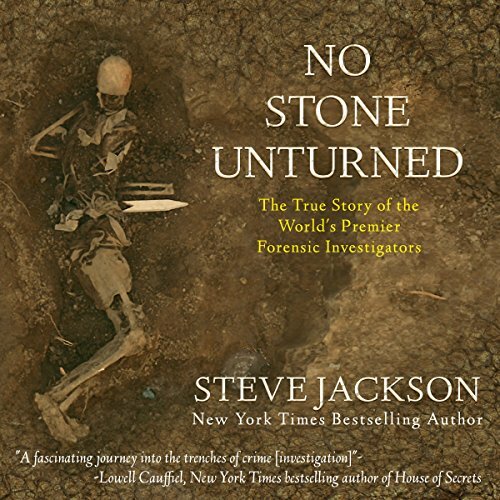 No Stone Unturned is an updated version of an earlier book on the founding of NecroSearch International, a group of scientists from multiple disciplines which formed in the 1980's. NecroSearch International specializes in searching for clandestine burials of murder victims. It provides an in-depth look at both the people who formed it and it's growth from a loosely knit group into an internationally known non-profit organization. Both the science and the motivations of the people involved make for a fascinating and often intensely moving listening experience. 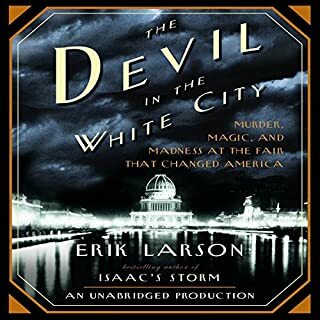 I don't often listen to non-fiction audio books, but it seemed to me that Kevin Pierce's narration was almost perfect for the subject, neither overly dramatic or too much like an entirely uninflected reading of the material. 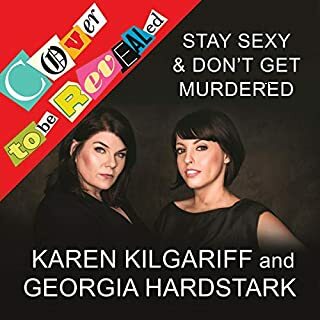 I highly recommend No Stone Unturned for anyone interested in forensics or our often labyrinthine justice system. I received a copy of No Stone Unturned in return for an honest review. 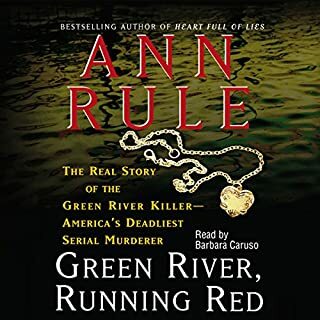 I don't read a lot of nonfiction, but I do like a good true crime story. As I started No Stone Unturned, I thought, "Uh-oh, this is a science book." I was learning about "soil horizons" and maggot growth, but since it was a gift from the narrator, Kevin Pierce, I decided to keep on trying. I'm so glad I did. The author carefully constructs the book so that you are armed with the science before he introduces the crimes that the scientists solve. Once equipped, you can better follow the details when the crimes are introduced. 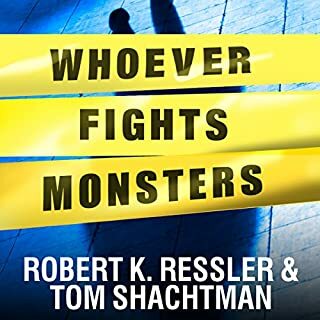 The reader gets a good profile of the criminal, the victim, the NecroSearch members involved, and the science behind the finding of the body and the prosecution of the perpetrator. In this edition, the author updates with an epilogue after each search, and adds an additional epilogue at the end. There's another book of NecroSearch's cases coming out soon, and I'm eager to listen to it.Pierce does a great job of making the science interesting, and the searches riveting. I hope he will be narrating the follow-up book. 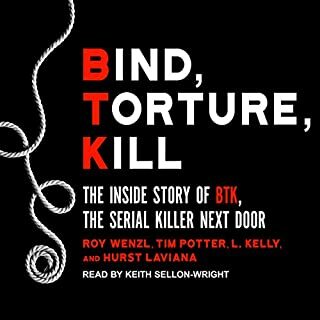 This is a unique approach to the true crime book, and it got me out of my little box. It was entertaining, and I learned some things too--like why bloodhounds have wrinkled eyelids. Some of the best parts were involving the description of the science involved. I enjoyed listening to them work through the entire scientific process to figure out different problems posed. There were many scientific first in this book, and I absolutely love hearing about the first time a scientist finds a questions, and then goes about discerning the truth in the best way they can. I think this narration by Pierce was right on point. He has the right kind of cadence and inflection for a book focusing on science, case studies, but also the stories about the people behind the science. It was articulate throughout, and I never once had a problem understanding everything he said. I found the entire book packed with interesting science and stories. The backstories about the people involved were just as interesting as the science itself. 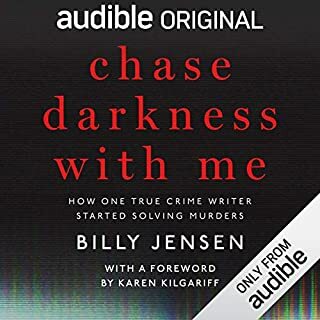 The only part that kind of slowed me down and I didn't enjoy as much was the second to last story about the meth dealers - The author spent WAY too much time setting up the entire scene, and by the time the actual forensic got involved it was over in a couple minutes. I would have cut this story and included one that was more science focused. Sherlock & Vidoq, eat your heart out! We've been brainwashed into thinking that murder investigation always start with a body found. Not so. How then, do we go about finding the body? Ghostbusters won't answer the call, but nowadays, NecroSearch is the organization to call. A fine group of science nerds and cadaver dogs have adapted and utilized technology usually known to us only through archaeology. 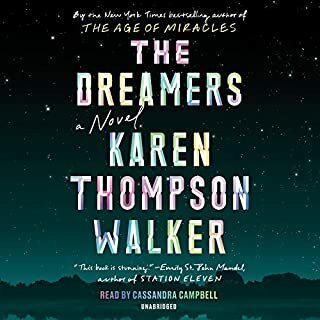 In this edition, the early cases which prodded the ideas resulting in a mobile team to provide what most departments cannot afford to keep on retainer are expanded upon and epilogues provided. Like the medical examiners, this organization aids law enforcement to speak for the dead, assists in providing justice for them, and bring closure to the grieving. KP takes audio performance tips from Joe Friday? Excellent delivery which makes it quite clear that this is reality, not fiction. 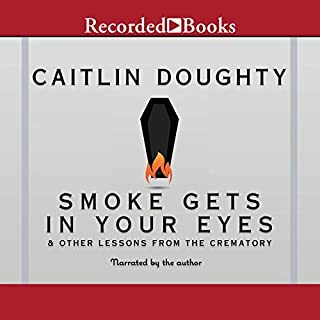 Thank you so much, AudioBook Blast for giving me the opportunity to learn. 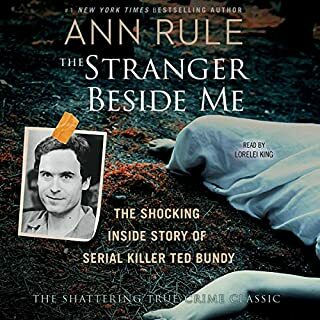 I enjoyed this book and would recommend it to people who have a soft spot for true crime but not just for the salacious qualities. I found this book fascinating. I was most interested in all the various scientific specialties that were utilized and the basic research done by the group. Necrosearch was founded in 1991 as a not for profit forensic investigation team. They specialize in homicide cold cases where a body cannot be produced. The team members are from a wide range of experts, from chemists, geophysicists, behaviorists, medical examiners, forensic anthropologist, photography, retired police officers to cadaver dogs. Jackson reveals in the book the burden of scientific proof with exciting stories of forensic field work and basic police work. 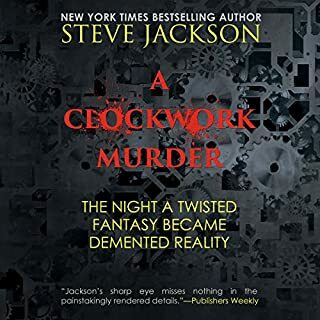 Steve Jackson is a crime journalist based in Colorado. He is now a member of the team. 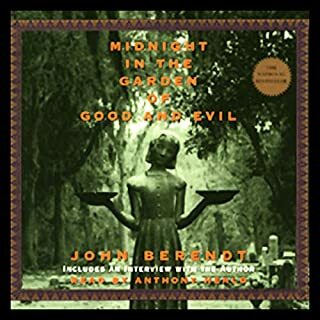 His first book was a true crime story called “Monster” written in 1998. He also writes fiction along with New York ADA Robert K. Tanenbaum for a series called Butch Karp. The first part of the book provides the history of forensics. I was surprised to learn that the French police were the first to us forensics and teach it in police training. The middle part of the book is about the original members of Necrosearch telling about the expertise and how it was first used by the group. The group’s research teams used pigs buried in different ways and depths to learn about the changes in graves over time so that they have provable information to look for such as changes in the soil, plants, insects, animals and in the electrical flow and chemical gases of graves. I found this absolutely fascinating. 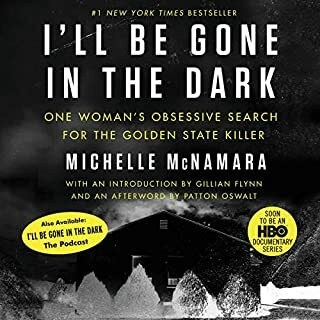 The last half of the book is about some of the field projects they under took such as the discovering the body of Michael Wallace who disappeared near Gunnison Colorado. The author covered this in depth from her disappearance, search and police work at the time to the Det. Young working it as a cold case twenty years later. Jackson covers the step by step work Young did to narrow the search area so Necrosearch had a reasonable search area. The author then covered the step by step procedures of the search and then the detailed work after the found parts of the body to local the entire body. 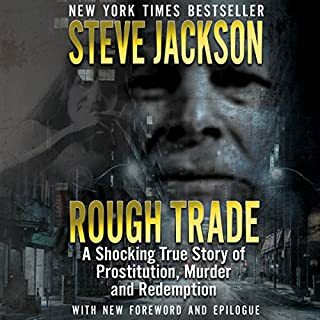 Jackson then covered in depth the trial of the murderer and the role the team played in helping toward the conviction. Jackson covered a number of other cases in almost as much detail as the Wallace case. The book is well written and moves at a fast pace. I understand another book about the team is on the way. Kevin Pierce narrated the book. Fantastic from top to bottom! I read some reviews that made me hesitant to give this listen a try. They said that the book started off slow and went into too much scientific detail. Well, I'm not sure what these people were talking about. The "story" was fascinating from the first "page". Beyond the book itself, Kevin Pierce was a perfect fit for the book and absolutely fantastic. 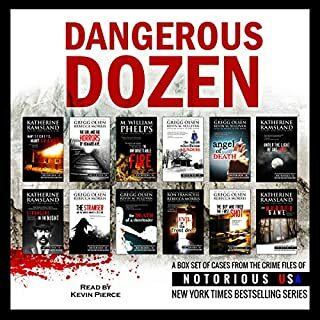 If you are a fan of the HLN series Forensic Files, you will love this book. Well written; reads like a novel. Interesting and informative look at the ground-breaking forensic team that takes experts in different scientific disciplines and combines their knowledge, expertise, and equipment to provide Sherlock Holmes-like results in finding clandestine graves. Getting through the beginning chapters with the innately dry nature of an introduction to forensic science, the listener is greatly rewarded with many case studies and the newly acquired knowledge to understand Necrosearch's role in those cases. 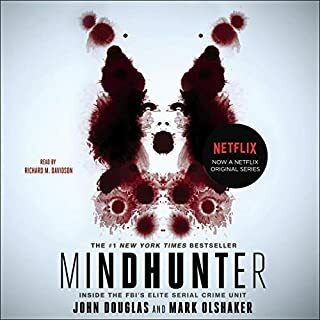 Highly recommended to anyone interested in science, investigations, or true crime.